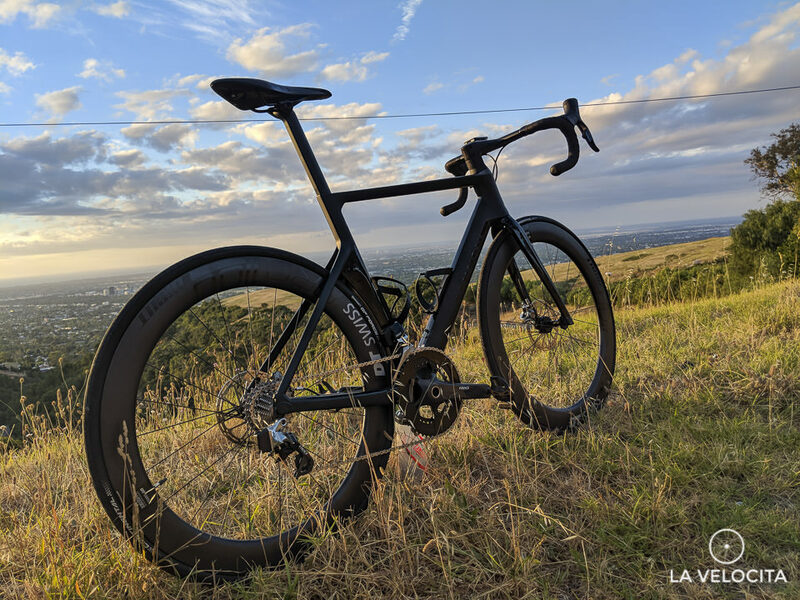 Canyon Aeroad CF SLX Disc 9.0 LTD review - LA VELOCITA. We hit up Canyon before the Tour Down Under to borrow one of their flagship aero bikes. A few day later I returned the Aeroad CF SLX Disc 9.0 LTD and I was an exhausted shell of a human. I rode that bike fast because that’s what it demanded. It’s an intoxicating bike. I weighed the bike at 7.6 kg “rolling weight” including 105 carbon pedals, 2 bottle cages and 2 small flashy lights. Canyon’s claimed weight for this size is 7.1kg. This bike is a revelation to ride. Can a bike be crazy fast, comfortable, and un-dramatic all at once? The Aeroad can. Let’s start with the beating carbon heard of the bike: the frame/fork/seatpost pyramid of awesome. The frame is a long ‘n low with a pretty exceptional reach of 392 mm in Medium size with a 564mm top tube. Compare that to, say, a Giant TCR which has the same top tube and only a 370 mm reach. The head tube is short at 146 mm, and the head/seat angles are incredibly specific at 73.25 and 73.5 degrees respectively. In short, this is designed for going fast in an aggressive position. And go fast it certainly does. To date, this is the most willing bike I’ve ever ridden. You can feel it on the road. Anyone whose cynical about the practical effects of aerodynamics needs only ride this bike. Push it through the rapid acceleration phase and it clings onto its speed. Everything feels like it’s willing you forwards. That feels fantastic on the flats as the bike responds to your kicks. It even climbs well. I set some scorching times on local hills that I usually hit with my own 7kg climbing bike. It doesn’t feel overly lumpen on quite steep roads either, as it takes your out of the saddle thrashes with ease. It’s not surprising to see Movistar and Katusha climbers opt for these bikes on hilly stages. Sure, you surrender a few hundred grams to climbing bikes, but you gain plenty of speed back on flatter terrain. Bottom bracket stiffness was surprisingly less than expected. The days of immovable carbon bottom brackets in core marketing are winding down, according to this CyclingTips podcast and this frame is indicative. There’s slight initial flex as you stand at the lights and sink your boot in into the pedals. Only a little, but most people wouldn’t expect that of a pro spec frame. That said, I never wanted for a stiffer bottom bracket. The front end is superb with predictable and well-mannered handling. It’s not the fastest handling bike but it’s easily the most stable-feeling race bike. There’s no drama or fight when getting an Aeroad down a twisty descent. It does what you want, when you want it to. Again, it’s surprisingly comfortable at the front end and, again, that comes from some dialled in compliance. The integrated bar/stem flexes a little, evident when thrashing up hills and pounding bumpy pavement. It’s an intelligent design to offset the stiff and beefy fork/head tube duo. Moving to the rear, there’s a lovely seatpost that’s effectively a cut-off teardrop shape. It’s narrow, allowing side-to-side flex and the cut-off teardrop lets it flex backwards slightly. You can see the flex when you’re riding if you choose to stare down at your own junk. The rear-end effectively protects your rump and back from transferring the vibrations and bumps from the road. It’s so unexpected to find an aero race bike this comfortable. This was my first experience with SRAM’s eTap HRD and I was suitably impressed. The 2-paddle shifting is intuitive and easy to get used to. Right paddle moves the chain towards the flatlander gears, left paddle moves it towards the climby gears, and both paddles at once changes chainrings. Simple. Elegant. Easy, and no missed shifts. Default shift speed is decent, slightly quicker than Di2 but not as quick as the faster mechanical sets. Shift accuracy is excellent too. I didn’t miss a shift in my numerous hours of riding. The ergonomics are a pleasure and the shift paddles are substantial. Braking is very impressive. Hydraulic discs are damn powerful, that much we know, but I was enamoured with the modulation. There’s a short lever throw to get pads on discs, and then more travel to feed in braking power. It’s a leap forwards from earlier road-hydro-disc setups that functioned more like an on/off switch. Hood and lever ergonomics are very nice with a bulbous top to fill up your hands. They’re not pretty, but they feel good in the hands. The shift paddles are massive so hitting them is easy and the brake levers are close to the bars for easy access. My only issue for the test period was horrific brake noise. The bike was brand new, so I experienced the first few days of ownership as any buyer would. The brakes were briefly quiet but made a lot of noise after its first descent. It’s not surprising of new hydraulic brakes but it did annoy the hell out of me for the remaining time with the bike, and probably freaked out every dog within a kilometer of me slowing down. The noise would certainly have me visiting my local bike shop for help. I did have the pads checked for contamination but they were still clean. The callipers and discs were pretty noisy. Pretty too. Canyon’s choice of DT Swiss ARC 1100 Dicut is consistent with the overall fast but comfortable direction of the bike. 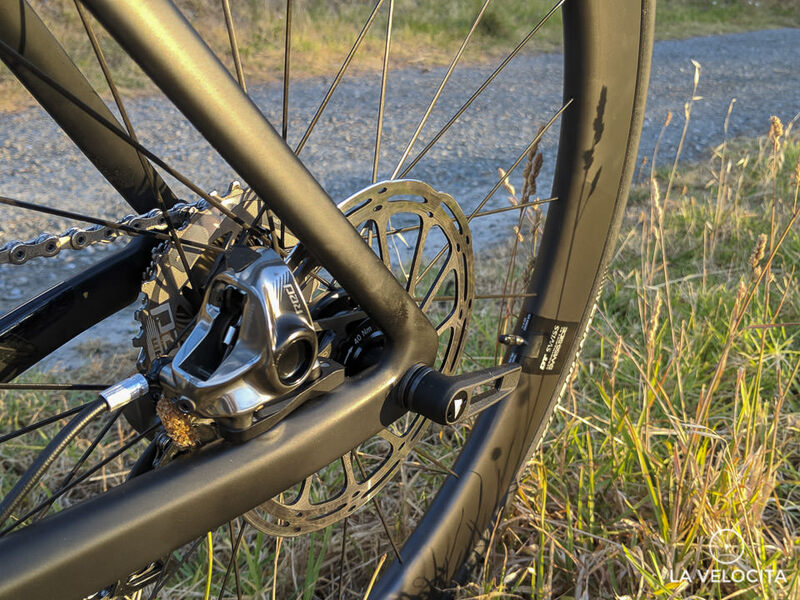 They’re a deep wheel, 62mm, for the mad aero gains but they’ve adopted the width that’s possible with the adoption of disc brakes, a plump outer width of 27mm. That spreads the tyres wide and gives a ride quality far better than expected from a 23mm from and 25mm rear. They’re plenty responsive to acceleration and the ratchet engagement is quick with little lag. Once rolling, they just keep their speed very well indeed. The risk with rims of this depth is always windy conditions. My test period included 2 days of disgustingly blustery conditions around Adelaide. The wheels were far better than expected. They still catch wind and will get tugged around by gusts, but I’ve ridden far shallower rims that performed far worse in the wind. Still, I did have one "brown knicks" moment in a particularly violent gust. As an added bonus the rims are tubeless ready. Good luck finding valves long enough though. Tyre choice is the Continental Grand Prix Attack III in 23mm fitted to the front and Force III 25 mm fitted to the rear. The rationale is maximising aero at the front, and giving greater grip at the back. The tyres feel very similar to the ubiquitous GP4000 SII that shares the same BlackChilli compound and Vectran puncture protection strip. They roll nicely, and felt great once I dumped all the air out of them down to 70 psi. They’re a quality tyre, as you’d expect from a bike flirting with the $10k price barrier. Let’s start with the fancy integrated cockpit. They have a short-ish 77mm reach and 128mm drop so getting into an aggressive position is easy. The flats are nicely rounded, with no sharp edges so it’s a comfortable place to rest your hands. As mentioned above, they’re not rigid so they work to dampen vibrations. Canyon claim a 5.5 Watt saving over a standard cockpit. I can’t verify this unfortunately, my wind tunnel is getting calibrated. Special mention must go to Canyon’s Ergospeed gel bar tape. It’s grippy, and very comfortable. So the cockpit is comfortable and fast, but you can’t ignore the impracticality of it. You can’t change bar angle, can’t try a different stem, and won’t maintain your reach if you add or remove spacers. Plus, mounting anything to them is a pain. Great bars, but they’d be hard to live with. The Fizik Arione is a perfectly serviceable saddle. I was an Arione user for years and got along with it just fine until moving on to other saddles. It’s very flat and quite narrow at just 132mm and weighs 185g. It’s an appropriate saddle for the build. I know many people don't like Ariones but most serious riders will turf the saddle on new bikes, especially at this pricepoint. 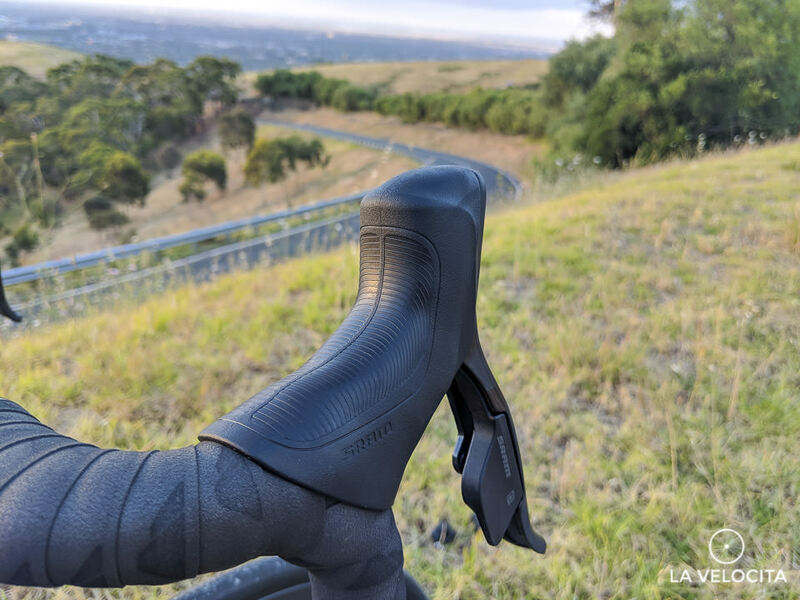 This saddle is fine, this seatpost is fantastic. This is one hell of a bike. The ride is fantastic, the components are top-notch, and it hits an impressive price. Yes, $9,399 is a lot of cheddar, but Canyon are squeezing a lot into the complete package. Retail on frameset + wheels + groupset in Aussie dollarydoos is already well above the cost of the complete bike. That's damn impressive. The Canyon Aeroad CF SLX 9.0 LTD is smashing through a lot of conventional wisdom. It’s comfortable, climbs nicely, and handles exceptionally well. Race bikes just shouldn’t feel so manageable. This is a KOM destroyer, and a price-point annihilator. So what are the drawbacks? There aren't many and I have to be very petty to find them. It's very focused on going fast. 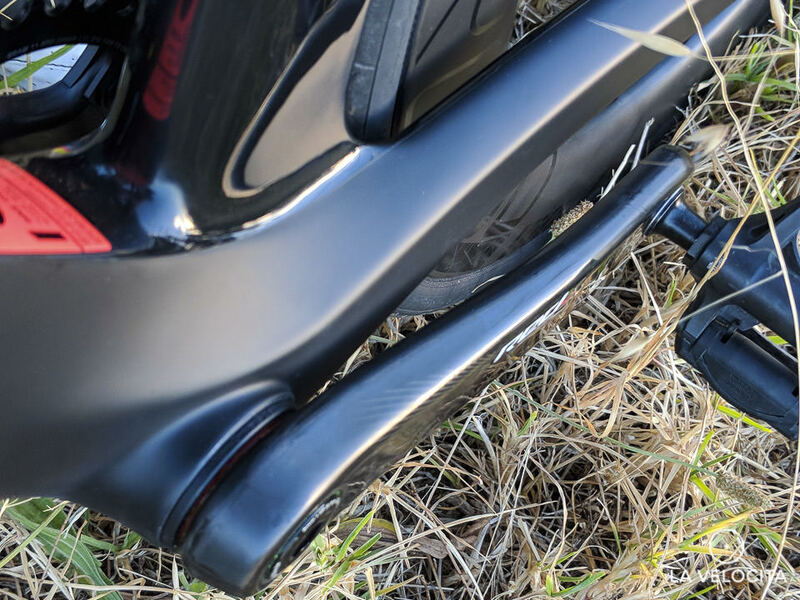 You'll need to be very sure of your bike fit to confidently buy the integrated bar/stem. The groupset is excellent, but I sincerely hope those brakes can be quietened. Finally, all that carbon around the rear wheel gets loaded with muck. That's basically it. Told you I had to be petty! Disclosure statement: This was a demo bike taken from Canyon Australia. Once we were done it was re-absorbed into their fleet for other lucky punters to ride. Big thanks to Canyon Australia for letting us have it. This bike turned heads wherever we took it. It’s in a market sub-sub-sub segment of one. Is the future wireless? We hope so.